The high quality Slumber Night Sovereign Motorised 3' Divan Bed with its 3-way German motorised action and superb Sovereign mattress, is available in a range of sizes. It combines style with comfort and may help relieve back pain, poor circulation, aches and pains. The Slumber Night Sovereign Motorised 3' Divan Bed is a High Quality Adjustable Bed with a 3-Way German Motorised Action. This luxury adjustable bed, combining style with comfort, is available in a variety of sizes to suit individual needs - it may also help Relieve Back Pain, Poor Circulation, Aches and Pains. 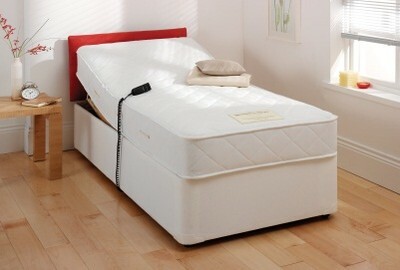 Available with the luxury Sovereign Mattress, the Slumber Night Sovereign Motorised 3' Divan Bed incorporates an 800 Count Zoned Pocket Spring System, providing excellent spinal column support and a lavish Layer of 40mm Visco Elastic Memory Foam, which naturally shapes to the contours of the body. Finished in a High Quality Belgian Knitted Ticking, this Micro-Quilted, Non-Turn Mattress promotes a softer feel. The Slumber Night Sovereign Motorised 3' Divan Bed has the added benefit and reassurance of Slumber Night's 1 Year Guarantee. The Slumber Night Sovereign Motorised 3' Divan Bed is available with Free Delivery throughout our Free Delivery Zone - Northern Ireland and Counties Monaghan, Louth and Dublin. Has an Adjustable Bed been recommended to you or a family member for health reasons? If so, and you live in Northern Ireland, request a letter from your Doctor and we’ll Zero Rate The Vat on your purchase! Yes, you will not need to pay the 20% VAT!